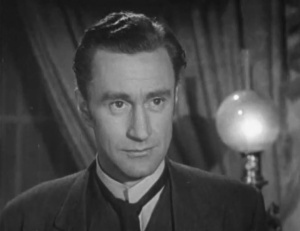 Sherlock Holmes (US) or The Adventures of Sherlock Holmes (UK) is an American TV series of 39 episodes with Ronald Howard (Holmes) and Howard Marion-Crawford (Watson). All episodes have been filmed in France, at Épinay-sur-Seine studios. The town of Paris helped to the making of the decoration sets by giving thousands of cobblestones for the reconstruction of Baker Street. Among the supporting roles, can be find young french actors which became famous in France: Delphine Seyrig, Sacha Pitoëff, Jacques Dacqmine, Jacques François or Maurice Teynac. 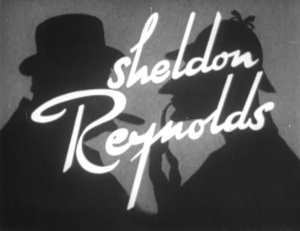 The budget of the series was so low that some scenes have been reused in several episodes (like the travelling from a cab on a Thames bridge). 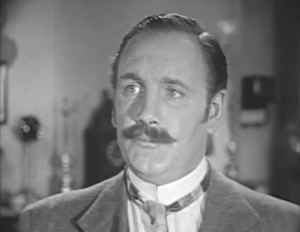 Also, several actors played different roles : for example, Archie Duncan (Inspector Lestrade) also played Sir Thomas Greystone (E16), Inspector MacDoughal (E28) and Malcolm MacGreggan (E35) ; Eugene Deckers played Serge Smernoff (E06), Harry Crocker (E09), Spaulding (E11), John Norton (E23) and Pettyfoot (E32)... Among others. 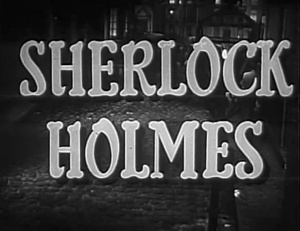 * are episodes adapted from a Conan Doyle's story. This page was last edited on 9 February 2016, at 00:05.